The Examination for Professional Practice of Psychology (EPPP) is an exam used for licensing purposes by the Association of State and Provincial Psychology Boards (ASPPB). The examination is taken via the computer through the Prometric network of testing centers. It is only supposed to be taken by individuals in a doctoral psychology program, a master’s psychology program in a state that grants licensure for those with a master’s degree, someone who has a similar degree that otherwise qualifies him or her to take the EPPP, or a candidate for licensure as a psychologist. Applying to take the EPPP is a multi-stage process. Before applying to take the actual exam, the individual seeking licensure must first apply to the licensing authority in his or her geographic region. The licensing authority will ensure that the individual meets the credentials for licensure in their own state or province. Prepare with our EPPP Study Guide and Practice Questions. Print or eBook. Guaranteed to raise your score. Get started today! Once eligibility is determined, the licensing authority will send the individual instructions on how to access the online application system for the EPPP (called PsyIMS), which is available through the ASPPB website. Once an application is processed, individuals have 60 days in which to schedule and take the exam. Scheduling should be done as soon as possible in order to increase the chances of being able to take the exam at a preferred time and location. Currently, the cost to register for the exam is $600 and there is also a non-refundable computer-based test administration fee of $79.58. Both fees will increase in subsequent odd-numbered years, although future price increases have yet to be determined. For individuals needing to reschedule or cancel their exam, there is no charge for doing so 31 or more days before the scheduled exam. If a change is made one to 30 days before the exam, a $62.50 charge will be assessed. Rescheduling or cancelling an exam within 24 hours of the scheduled appointment will result in no refund of registration fees. EPPP Flashcards. Proven EPPP test flashcards raise your score on the EPPP test. Guaranteed. Each section consists of between 12 and 15 percent of the entire test. The examination contains a total of 225 items. Of those, 175 are scored and 50 are considered pretest items. Pretest items do not count towards the final score and are randomly distributed throughout the test-individuals should not spend any time during the exam attempting to figure out which items are pretest items. When taking the exam, there is no penalty assessed for incorrect answers, thus individuals should pace themselves throughout the exam to allow enough time to answer every single question. Four hours and 15 minutes are allotted for the entire exam and there are no scheduled breaks. Candidates can take unscheduled breaks any time they wish, though the timer on the test will not stop during these. Every question will be followed by four possible responses, and there will be one and only one correct answer for every question. During the test, each individual will be reminded that they have an ethical and legal duty not to divulge any content displayed as part of the EPPP. All individuals are required to acknowledge their understanding of the candidate acknowledgement statement discussing as much before being allowed to proceed with the exam. The scoring system uses a scale that ranges from 200 to 800. Individuals will be given a scaled score that will allow for a comparison between various exams because the degree of difficulty between different versions of the exam may vary slightly. The ASPPB-recommended passing score is 500 for independent practice and 450 for supervised practice. For versions of the exam with a lower degree of difficulty, more correct answers would be required to obtain a passing scaled score. It is important to recognize that each individual board sets the minimum required for passing. While many boards use the ASPPB-recommended score, there is slight variation. Each individual licensing board will mail examination results to individuals, though some may elect to display scores online. Scores are sent to each individual licensing authority twice monthly and will be available within six business days following the 15th day of the month and the last day of the month. Each individual licensing board may take a different amount of time in actually reporting scores to individuals. Individuals who fail the EPPP may retake the examination up to four times in a 12-month period. Reapplying to take the EPPP can take place as soon as an individual learns that he or she did not receive a passing score on the most recent exam. To retake the exam, individuals must repeat the process of applying to the licensing board as they did the first time they took the exam. Individuals are strongly encouraged to review for the EPPP. However, because the test must be completed within 60 days of the application to the licensing authority being accepted, it may be advisable to begin studying before the application process is complete. 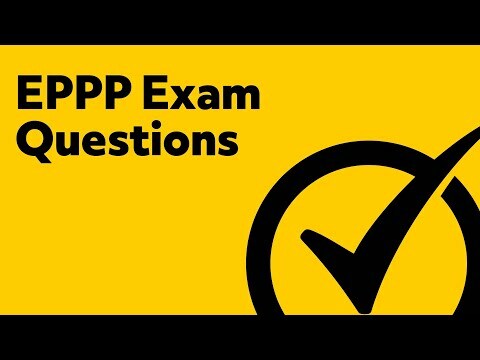 A variety of organizations offer testing services and guides for the EPPP, and the ASPPB offers a guide book offering sample questions and summaries of EPPP content areas free of charge to download from its website. Explore our free EPPP review provided by Mometrix. 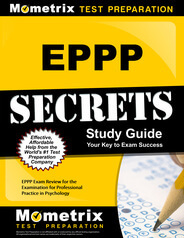 Check out our premium EPPP study guide to take your studying to the next level. If you benefit from these materials, just click the link below! 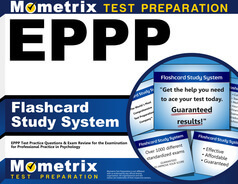 To compliment our EPPP book, we also offer extensive EPPP flashcards for even more EPPP test prep help. We hope you enjoy our products! Your purchase helps us make more great, free EPPP certification content for test-takers just like yourself.